Bringing web professional together to work with local governments. The web’s enormous civic promise, to encourage more engaged citizens to exert more influence over more open and responsive government, will only be realised if government can be ushered into the digital age. 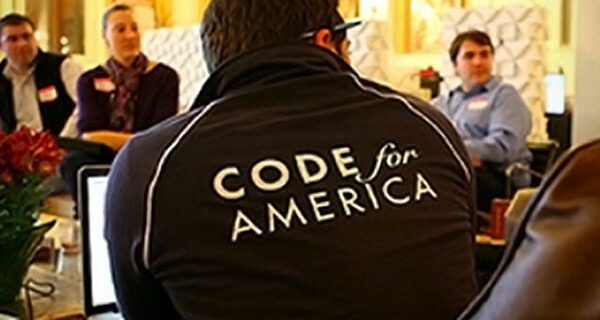 Code for America (CfA), launched in 2009, is probably the most impressive, combined effort to form a bridge between public servants and civic software activists to create a new generation of digital public services for towns and cities. CfA funds 26 fellows each year, not just web designers and software programmers, but urban planners, civil servants and environmental consultants, with an annual stipend of $35,000, to work with a city over 11 months to develop web-enabled public services. CfA’s San Francisco base is home to an accelerator programme for five civic-tech start-ups a year, each of which gets a small amount of money to develop ideas into prototypes. In 2013, these included plans for streamlining online procurement and making it easier to start up a company, and a tool devised by two Texas police officers, one a veteran investigator, so police forces could use their limited investigative resources to solve more crimes. The programme’s influence is spreading at the grass roots as well. About 26 cities now have local CfA “brigades”, modelled on the early volunteer fire-brigades that sprang into life as cities grew in the 19th century. These coding brigades, led by a local captain, are setting up “hack your city” events for public services to draw on the imagination and skills of young developers in their localities. A peer-learning network links civic leaders who want to promote digital public service solutions, and the CfA model is spreading internationally. In the summer of 2013 cities in Mexico, Germany and the Caribbean joined the programme. To be considered a trailblazer at the tender age of four is symptomatic of the speed at which this field has grown. Aspects of Code for America’s model have been picked up and tried out in a wide variety of permutations: as one of the first initiatives of its kind to gain widespread attention, it has undoubtedly inspired many groups to develop their own take on ‘social coding’.